Faced with a close vote on a leadership-backed map to redraw state Senate districts, the Florida Senate agreed to modify three minority-based districts in Miami-Dade County on Tuesday, hoping to win the crucial votes needed to send the proposal to the House and win support for the revision in court. The sponsor of the amendment, Sen. Miguel Diaz de la Portilla, R-Coral Gables, argued that change was needed to make the districts more compact, in compliance with the anti-gerrymandering provisions of the Florida Constitution, and to preserve the voting strength of Hispanic voters. He argued that the original map, which was drawn by House and Senate staff and approved on a party-line vote last week by the Senate Reapportionment Committee, diminished the ability of Hispanics to elect a candidate of their choice. But the change also had the effect of protecting the re-election chances of Diaz de la Portilla and Sen. Anitere Flores, also of Miami. Both had been drawn into the same sprawling Miami-Dade district — along with Sen. Dwight Bullard, D-Cutler Bay — in the original map advanced by Sen. Bill Galvano, R-Bradenton, the Senate redistricting chairman. Diaz de la Portilla’s change now gives Flores and Diaz de la Portilla separate districts, increases the ability of his brother, Alex Diaz de la Portilla, to replace him, but keeps Bullard’s home on the edge of the district now held by Flores. 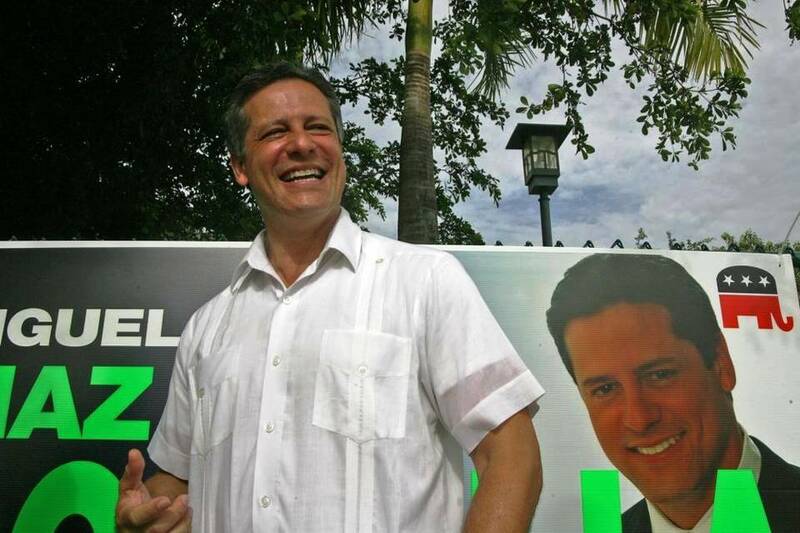 Senator Miguel Diaz de la Portilla, shown campaigning at Shenandoah Middle School in Miami in 2010, offered an amendment to the Senate map that redraws 3 Miami-Dade districts. Galvano defended the original districts but supported the modifications after rejecting more than a dozen other amendments offered by Democrats. The map immediately drew criticism from the challengers, a coalition of voters’ groups led by the League of Women Voters who successfully sued the Senate for violating the constitution. In a letter to Galvano and House Redistricting Chairman Jose Oliva, R-Miami Lakes, they said they were “very disheartened to witness” the passage of Diaz de la Portilla’s amendment and called it a violation of the incumbency protection provisions, known as tier-one violations. The amendment “unpairs Senator Diaz de la Portilla — the amendment's sponsor — from facing Senator Flores in District 40 in [map] 9090, and increases the Republican performance of Senator Diaz de la Portilla's new district in 9124 [District 37]. These tier-one violations cannot be ignored, particularly when Senators have already criticized the base map selection process as one designed to avoid paring incumbents,” wrote David King, lead lawyer for the challengers. King’s letter included an alternative map drawn by the challengers and a request that the Legislature consider it. For Senate leaders, the change may have been what was needed to secure the 21 votes necessary to pass a revised map in the face of a bitter feud dividing Senate Republicans over who will become Senate president in 2016. The outcome of the elections will dictate whether Sen. Joe Negron, R-Stuart, retains his edge over Sen. Jack Latvala, R-Clearwater. The original map, S9090, was promoted by Galvano, a Negron supporter, and was seen as the favored approach by the House GOP leaders, who also privately want to see Negron elected. But Latvala said the Galvano plan addressed none of the infirmities outlined by the plaintiffs when they sued the Legislature for passing an unconstitutional map in 2012. The Senate’s decision to settle that lawsuit and return to redraw the Senate map prompted the special session. Last week, Latvala threatened to oppose the Galvano map when it gets to the floor on Wednesday because he believes it is headed for another smack-down by the Florida Supreme Court. Now, at least two of Latvala’s supporters — Diaz de la Portilla and Sen. René García, R-Hialeah — said Tuesday they will vote for the map. But others are not so sure. Sen. Tom Lee, a Brandon Republican who has not publicly committed in the Senate presidency race but is counted as a Latvala supporter, said that he is willing to have all the Senate drama come out in court. House redistricting leader Oliva said he had not reviewed the new map but will have an opinion on it after the Senate votes on Wednesday. At the heart of the change is the voting performance of Hispanic voters in Miami-Dade. Diaz de la Portilla argued that while the districts are packed with Hispanics of voting age, too many communities were divided and the result was an inability for voters to cohesively back a Hispanic candidate in one out of the three districts. “It just didn’t make any sense,” Diaz de la Portilla told reporters. For example, the city of Doral was merged with Little Havana, and Little Havana was split at 27th Avenue. His change raises the voting age population by 6 percent in one of the proposed districts and 9 percent in another. But, according to the so-called functional analysis of voter performance, all three districts would have voted to elect Barack Obama in 2012. Democrats, however, said that while a case can be made for the amendment, it did not fix other flaws that the plaintiffs said were problems with the original map passed to protect incumbents in 2012. Meanwhile, the challengers to the Senate maps added even more to the confusion. They delivered to the Senate the primary data for key counties that had been intentionally left out of the map-making software by Senate leaders. Democrats say that the data are useful to show that black minority districts can perform in areas like Hillsborough County and South Florida without packing Democrats into them as Republicans have argued is needed.